Amazon.com Price: (as of 2019-04-25 14:14:56 GMT) Product prices and availability are accurate as of the date/time indicated and are subject to change. Any price and availability information displayed on Amazon.com at the time of purchase will apply to the purchase of this product. 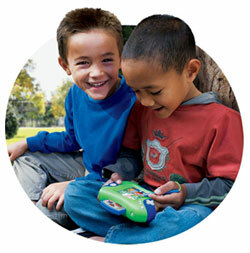 The Leapster2 Bundle includes the Leapster2 handheld learning game system, an Outwit! game cartridge, an A/C adapter, and a carrying case. The Leapster2 offers kids ages four to eight four different ways to play: cartridge games, game downloads, connect, and creativity castle. The Outwit game works will all Leapster models and challenges your child’s mind with 15 fast-paced brain games. The A/C adapter allows you to power the game system directly from an outlet, and the carrying case makes for easy storage and portability for on-the-go enjoyment. Includes the Leapster2, an Outwit! game cartridge, an A/C adapter, and a carrying case. View larger. Kids can play and learn on the go. The Leapster2 is the winner of a range of industry awards, including Parent Magazine’s Best Toys Award and Toy of the Year from Family Fun. It’s no mystery why: This compact, well-designed gaming system is independent learning masquerading as video game fun. 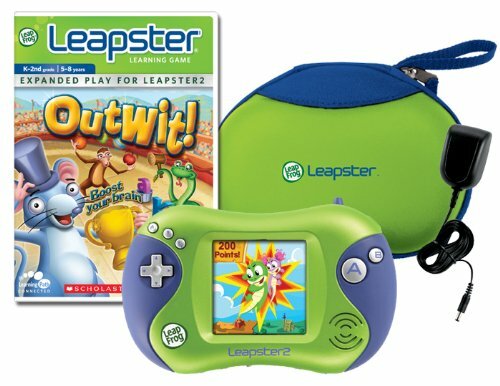 Leapster2 comes with a starter game kids can download and has a library of over 40 other action-packed games that let kids play with characters they love–like Dora and Diego, SpongeBob, and the Little Mermaid–while learning preschool to second-grade level skills. Multiple skill levels in each game help keep kids interested. Leapster2 now features an online dimension that’s accessible when you install the included CD-ROM. While online, kids can access rewards like certificates, coloring pages, and flash cards, and download and play additional learning games. They can also draw, paint, add animated stamps or weather effects on the Leapster2, and upload their creations to the Creativity Studio to embellish and share. The online connection gives parents access to what LeapFrog calls the “Learning Path,” which shares details about which games and activities children play most often, what questions they’re answering, and what different learning benefits these games and questions provide. New skills appear as little digital footprints that then become “stepping stones” on a child’s “Learning Path”–a visual representation of everything he or she is learning. For instance, if she’s been busy with math-focused games, the footprint may say “Math: Subtraction” and you can click on it to read more about that particular skill set. Our testers found the Learning Path to be a convenient way to keep tabs on what kinds of games/activities a child chooses most often, as well as those he or she avoids. Armed with that information, parents can appraise their child’s overall academic skill set, including areas of improvement. The Leapster2 offers the convenience of both corded and cordless operation. Battery operation requires four AA batteries (not included), while an A/C adapter (not included with the Leapster2, but part of this bundle) lets you plug the system into any wall outlet. This Leapster2 bundle includes the game Outwit! for kids ages five to eight. Games like Compare and Contrast (where kids have to find the one that’s not like the others while a timer ticks away) are great for kindergartners, while Spatial Reasoning helps older children develop problem-solving skills by asking them to identify what a certain shape would look like if folded in half, again with a timer ticking away. Speed and accuracy count, and as children expand their skill sets, the games adjust to continue to challenge them. The included carrying case protects the Leapster or Leapster2 on the go and has a wrist strap for easy carrying, although it may be too big to stay on smaller wrists. There’s also room inside for four game cartridges, and a piece of elastic holds them in their compartment. It zips open and closed. This simple case also helps parents encourage kids to clean up and take care of their system and games when they’re done playing for the day. The Leapster2 is backed by a three-month warranty. Leapstear2, installation CD-ROM, USB cord, instruction booklet, Outwit! game cartridge, A/C adapter, and carrying case. Sunshine Kids Radian XTSL Convertible Car Seat just $239 Shipped!